1. Preheat the oven to 200ºC, gas mark 6. Trim and scrub the beetroot and cut into thin wedges. Put in a roasting tin with the onions, drizzle with 1 tbsp of the oil and mix well. Roast for 30 minutes. Stir in the cumin and garlic, then return to the oven for a further 15 minutes until the vegetables are lightly caramelised and tender. 2. Put the couscous in a saucepan with the bouillon powder and 350ml boiling water. Cook gently for 6-8 minutes until the water is absorbed and the couscous tender. Combine the orange zest and juice in a small bowl with 2 tsp of the remaining oil and a little seasoning. 3. Heat the remaining 1 tsp of oil in a frying pan and fry the cheese for 1-2 minutes on each side until golden. 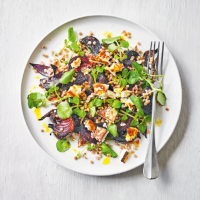 Combine the watercress, roasted vegetables and couscous in a large bowl and spoon onto serving plates. Crumble the cheese over the top and drizzle with the dressing to serve. 2 of your 5 a day; source of fibre. This recipe was first published in Tue Apr 02 10:05:40 BST 2019.